Summary: Otis Barton loved the ocean from childhood, and dreamed of inventing a contraption that would allow him to explore deep water. Will Beebe was a scientist who studied the natural world and became enamored of undersea life on a diving trip off the coast of the Galapagos Islands. 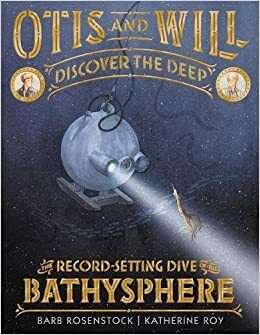 The two men decided to build the Bathysphere, a 5,000-pound, four-and-a-half foot enclosure that would descend to the depths and allow them to see what was there. On May 27, 1930, they made their first trip, aware of the dangers of leaks, explosions, and the wrong amount of oxygen. They succeeded, though, reaching a depth of 800 feet, and being the first to see what the ocean looked like at those depths. Includes a lengthy author’s note with photos and additional information about both men and the Bathysphere, as well as additional sources. 48 pages; grades K-5. Pros: The story is simple and straightforward, yet the author’s note adds enough information to make it a good read for fourth and fifth graders. The rich illustrations bring the undersea world to life, including a foldout page of Otis and Will’s view at 800 feet. Cons: Including a date or two in the main story would have helped place it in historical context. I had to turn to the author’s note to figure out when it was happening.